Most Blessed Virgin, whose Heart is Sorrowful and Immaculate, we recognize thee as the Lady and Queen of this house. Have the kindness to preserve it from every evil; from fire, water, thunder, storms, earthquakes, from robbers, wicked people, from revolutions, war, raids, from persecution and taxes, from any other evil known by thee. Bless, protect, defend and preserve as thy personal property, those who live and will live here. Keep them from adversity and misfortune but, above all, preserve them from offending God. Let not a single mortal sin be ever committed in this house. And may all those who enter it, work for the Glory of God and for the Reign of Jesus and Mary. 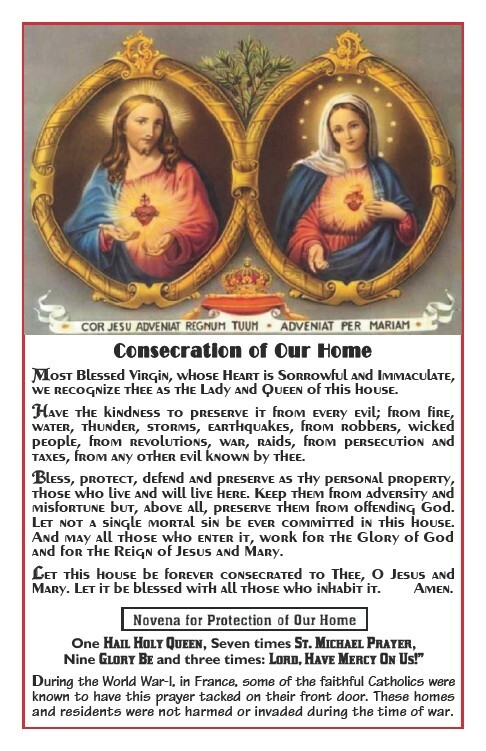 Let this house be forever consecrated to Thee, O Jesus and Mary. Let it be blessed with all those who inhabit it. Amen. One Hail Holy Queen, Seven times St. Michael Prayer, Nine Glory Be and three times: Lord, Have Mercy On Us!” During the World War-I, in France, some of the faithful Catholics were known to have this prayer tacked on their front door. These homes and residents were not harmed or invaded during the time of war.